Upon arrival in Los Angeles for the first time in over four years I was admittedly surprised to learn that the paper tickets for proof of payment on Los Angeles Metrorail had been completely phased out only a few weeks earlier. In their place was a new smart card system called TAP (Transit Access Pass), whose validation posts I had seen pop up over time while residing there. After some initial confusion it was quite pleasant to discover that not only did the fare vending machines dispense TAP cards for a small fee, they also allowed riders to load a variety of passes on their cards. After considering the smart card systems I had used in Chicago (Chicago Card) and Washington DC (Smartrip) I felt compelled to compare the advantages and disadvantages of these particular cards used by the transit systems as they pertain to me. 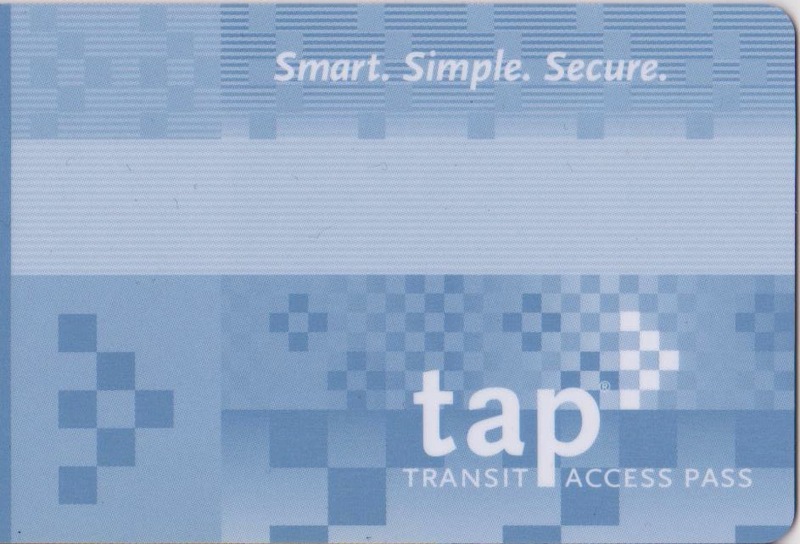 The Transit Access Pass or TAP Card, aptly named, is used primarily by Los Angeles Metro on their rail and bus services. One reason for introducing a smart fare card system was the need for passengers to pay in order to pass through a turnstile. Los Angeles Metro had for a long time operated using a proof-of-payment system where riders had to display their ticket upon request by a fare inspector. The entire system was barrier-free for a long time which made sense considering the at-grade layout of the first light rail line in LA, the Blue Line running from Downtown LA to Long Beach. Fare gates would present no obstacle to evaders at these stations. When the Red Line subway and Green Line light rail systems were completed proof of payment was used on those systems as well, even though there would have been no obstacle to implementing fare gates at those stations (Red Line positioned underground and Green Line elevated and/or freeway median). The entire system remained barrier-free and the opportunity to implement fare control was passed over. While magnetic strip paper fare card systems had been in use for a while on systems like the Washington Metro the system designers in LA apparently decided to forego this step and simply wait for smart card systems. An interesting comparison comes up when comparing the Los Angeles Metro to the Buffalo Metro. The Buffalo Metro uses paper fare cards with a magnetic strip even though the system is strictly proof-of-payment (although it wouldn't be difficult to implement fare gates in the subway portion, the cost-benefit analysis has clearly yielded a nay on the issue). The magnetic strips are used when paying bus fare, and the printed nature of the ticket means that it can be verified visually if there is a technical issue. The tickets have a reflective dazzle pattern to deter counterfeiting, a feature the Los Angeles Metro tickets never had, which perhaps contributed to fraud and revenue loss in addition to fare evasion. Fare Options: Pretty much any type of pass or fare can be loaded onto the TAP Card at a Ticket Vending Machine, which support cash as well as debit and credit cards. This includes daily, weekly and monthly passes as well as zone surcharges. Dual fare option: Passes and cash can be loaded on the card at the same time, which simplifies fare payment significantly. If a rider's pass is not valid on a particular transit system, then the cash fare can be deducted instead. The TAP Card is an interagency card but the agencies retain their own fare systems although there are transfer privileges. Still, the ability to hold passes and cash means that a rider only needs one card for their entire journey. There is also a nice benefit for the forgetful transit rider, in that as long as they have sufficient cash on their card they can still ride in the event they have forgotten to renew an expired pass. Such an option would certainly alleviate frustration among some riders. 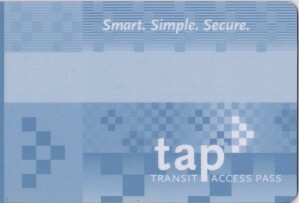 Acquisition: a TAP card is comparatively easy to obtain compared to other systems where applications have to be submitted and cards mailed since they are dispensed at ticket vending machines, and sold on buses as a daily pass; considering that it is the only fare payment option for the steadily expanding rail system, this is a no-brainer. Replenishment options: putting more money on the card can be done at a TVM, online, over the phone, or at retail outlets. Considering how vast Los Angeles County is, the more options the better. One common criticism of the Smartrip card in DC during its early days was how hard it was to get ahold of one and put money on it. Online fare options: Only straight replenishment or a monthly pass is available online. All the other pass options have to be purchased before riding the system. The dual cash-pass nature of the card may have something to do with this; unless the fare system has the capability of allowing riders to select when they want their daily or weekly passes to be used, there would be no way for the fare payment machines to know what option to select when the rider taps their card to the machine. Monthly passes are less of an issue since they are intended for frequent riders and likely to be used with high frequency. The lack of options online contrasts with TVMs that allow riders to add daily and weekly passes to their TAP cards. Perhaps there is a financial reason why Metro will not allow lower value passes to be added online (maybe related to transaction fees) or there is a limit to how much information the cards can contain so there would be no point in selling multiple day passes for different dates in advance. In cities like Buffalo that offer day passes they are only valid on the day they are purchased, mainly because the passes sold at TVMs are still proof-of-payment with printed dates even though they feature a magnetic strip, which could encode the necessary date information. On the other hand most of the passes sold are plain paper with dates and serial numbers, so selling day passes in advance would raise costs and likely lead to waste. No fallback in some cases: if a TAP card malfunctions on the bus, fare can still be paid with cash. The train, on the other hand, is TAP only (and the only way to pass through turnstiles on the subway). Even though riders are supposed to tap their TAP cards to pay their fare before boarding, something could still happen to them later. When riding MARTA in Atlanta after the implementation of the new Breeze system my first trip resulted in a declined smart fare card when transferring from train to bus; the operator simply let me board, and I sensed this was a regular occurrence in those days. Need for validation: since the bulk of the Los Angeles Metro rail system is barrier free there are undoubtably quite a few people who simply neglect to deduct their fare by tapping their TAP cards to the fare machine before boarding and face fines as a result. Even if someone has sufficient money on their card for their trip, Los Angeles Metro is quite explicit on the need to TAP before each boarding. Other systems require more steps: the PRESTO fare card in Toronto requires riders using the GO Transit commuter rail to tap their cards before and after riding in order to calculate the appropriate fare unless the rider has selected a preferred route. Failure to tap off results in underpayment and problems for the rider.